Friday marked the conclusion of the Division III Men’s Golf Championship at Grandover Resort in Greensboro, North Carolina, and Round 4 started with clear frontrunners in both the team and individual standings. The DIII Men’s Golf Championship ended with drama in the individual competition, and anything but in the team competition. 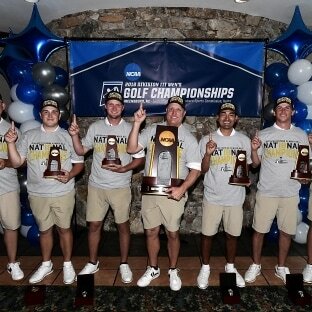 Methodist, which entered Friday with a 10-stroke lead, shot 8-over par in the final round but still won its 12th national title by 11 strokes over second-place Washington & Lee. Methodist’s 1st-to-5th spread was a tidy eight strokes on Friday, including a 1-under from Jared Chinn. On the individual side, Brian Peccie of Washington & Lee earned medalist honors after a three-hole playoff with Logan Young of Concordia. Peccie and Young both shot a three-under 285 for the tournament before heading to the playoff, where it took a few extra holes to settle the final score. Forty-one schools and 216 participants will take to the course in search of the 2018 national championship. Wittenberg, who received an automatic bid out of the North Coast Athletic Conference, will look to repeat as national champions after capturing its first title in the program’s history in 2017. Guilford, last year’s runner-up, will host the event at Grandover Resort. Methodist, who last won the title in 2015, enters Grandover Resort as the No. 1 ranked team in the latest Golf Coaches Association of America poll. Junior Josh Gibson of Hope looks to defend his individual title as well. He will face stiff competition from all the participants, including the six that were chosen from the remaining schools that did not qualify.